This elegant decanter keeps wine safe from oxidation with a patented sealing mechanism. What's that half-full bottle of Malbec whispering? Ah: "Save me." Don't rely on stoppers or corks to keep oxygen from ruining your wine. 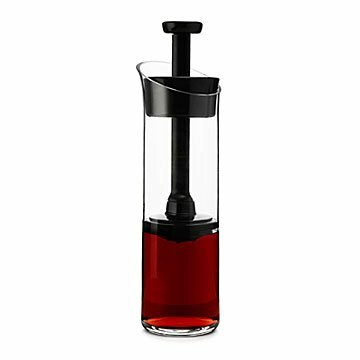 This innovative decanter keeps the nectar of the gods safe from oxidation with a patented sealing mechanism—just push it down to wine level and twist to seal. Preserved in an elegant, lead-free crystal decanter, your wine stays fresh for two to four weeks (depending on the varietal), and the seal is so strong you can even lay it down in the fridge or your fancy-occasion picnic basket. Made in China.